This recipe brings back fond memories of my mother and some of the interesting things she would cook for us back in the 1970s. This was a popular recipe in my mother’s circle of friends, and it’s one of the first things she allowed me to try by myself. I’m one of those cooks that always has to leave a little raw cake batter aside to savor later. While you don’t mix up the cake mix in this recipe I was in love with the taste of the butter as it mixed with the cake mix. Mother’s Dump Cake always ended up with holes in it because I would look for the sections that had the highest content of butter and cake mix. Preheat over to 350 degrees. 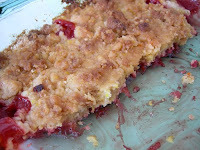 Use an oblong cake pan (13 x 9 x 2)---Do not grease. Each of the ingredients should be distributed evenly one on top of the other. Pour 1 can crushed pineapple with juice into the pan. You can also use a can of cherry pie filling as seen in the image. Sprinkle with 1 box dry yellow cake mix. Slice 1 ½ sticks margarine and arrange evenly on top of cake mix. Push 1 cup pecan pieces into mix almost covering nuts. Bake 45 minutes or till golden brown. Dump Cake is best served warm and is great served with ice cream!